If you’ve ever rented a car then you know the rental car routine when you go to pick it up. Check in at the rental car company, sign your contract, get a key for the car, walk around the car to make sure nothing is damaged, sign a form stating whether you found any damage to the car, then start your journey. Simple enough, right? Well, not exactly. A lot depends on where you are picking your car up at. He said it would be okay so I walked around the car, checked for damage, gave him the form and started to drive off. But the car felt “too fast” for me. I’m sure it was psychological but I had visions of getting in an accident and my insurance company having to pay an arm and a leg. So, I did what any paranoid person would do — I drove it back the few feet I had driven it. There was a woman at the counter now and I explained my hesitancy to her and said “I wish they wouldn’t have upgraded me to something I didn’t ask for.” She then pointed to another car and said “How about that one?” Well, this one was better but it was also large — a compact instead of an economy. It’s amazing how many times we don’t listen to what our gut tells us, isn’t it? So, I drove off into the rainy city of Seattle and arrived at my destination 45 minutes later. All was going well on this trip until … the sun came out. Now, normally in Seattle, the sun coming out would be a good thing and I certainly felt glad when it did. I visited the people I’d come to see and at the end of the day drove back to my friends house for the evening. For some reason, I had parked the car closer to the garage than I had earlier so I walked around the back of the car to get to the house. Then I saw “it.” Can you see it? Let’s take a closer look … see it now? Now, I absolutely, positively, knew that I had not been in a car accident and that no one had hit me since I was going from garage driveway to garage driveway most of the time. There was one exception — a mall that I went to but that was after I discovered the problem. I know what some of you might be thinking — oh, you probably parked it somewhere and someone side swiped you and you just didn’t notice. Well, that is possible but not probable. 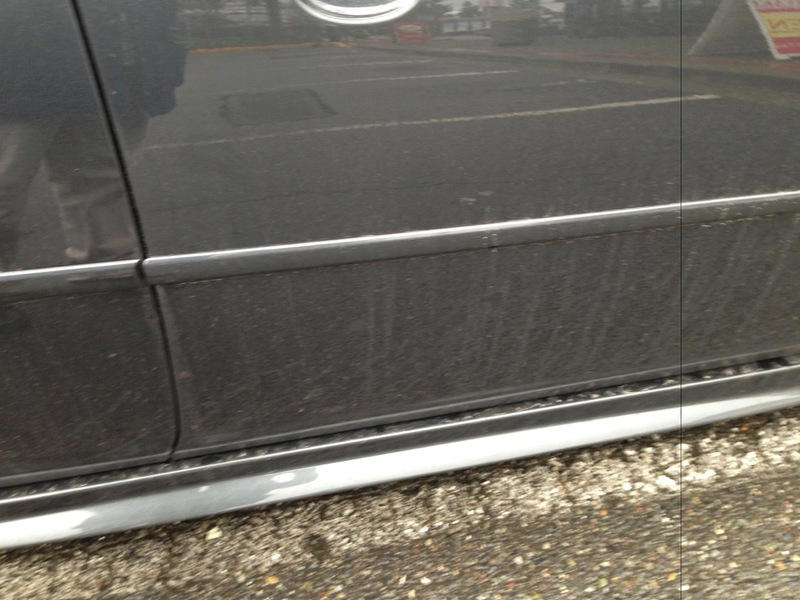 That is what the other side of the car looked like in the rain and it’s very similar to when I picked it up and it was wet from the car wash they had given it. 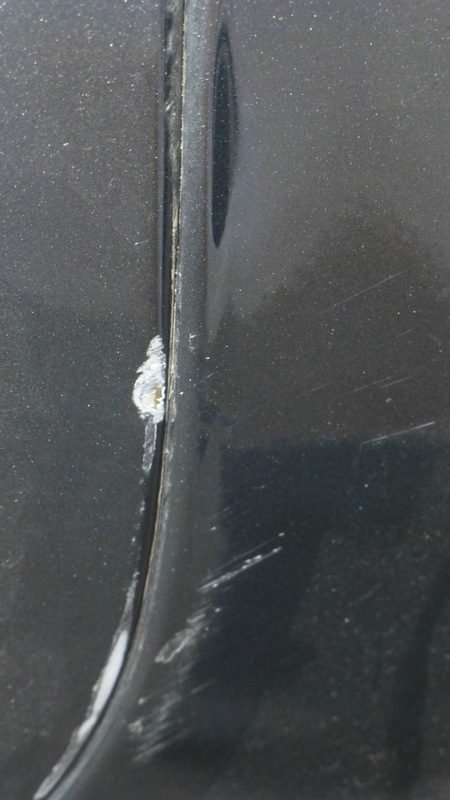 In addition, If you look very closely, the damage to the side shows that a small bit of the paint is chipped and a little bit of rust can be seen so this was not a recent occurrence. 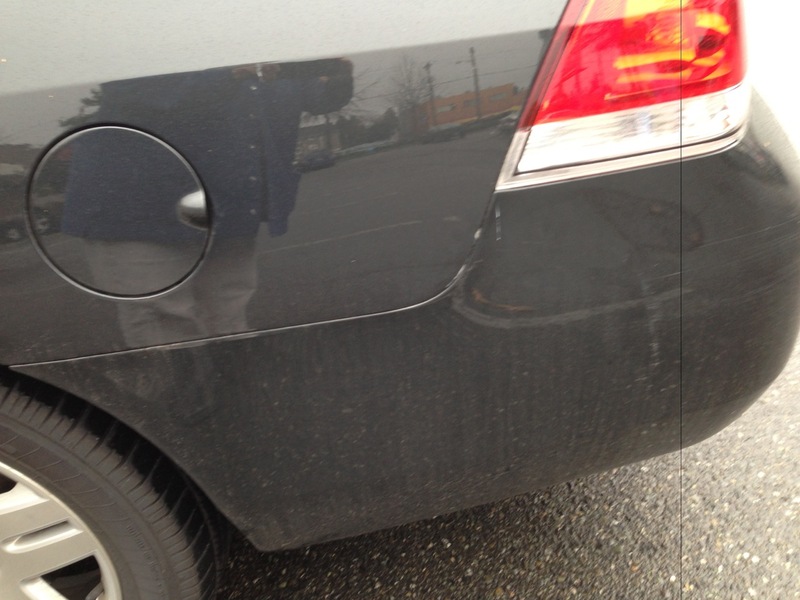 Did I miss this damage when I took possession of the car? Yes, absolutely. I should have followed my gut and written on the form they gave me “unable to determine if there is any damage due to lighting and wetness.” But I didn’t. So, what happened? I was anxious for the next few days and when I took the car back, I knew exactly what was going to happen. I pulled into the car rental drive, got out and waited while they inspected the car for damage. Then the most interesting thing happened. Side note: If you ever watched Star Wars, you probably remember when Yoda would put his hand out and the person he was trying to distract away from him would suddenly turn the other way. (This was because the “force” was with him). Anyone remember that scene? 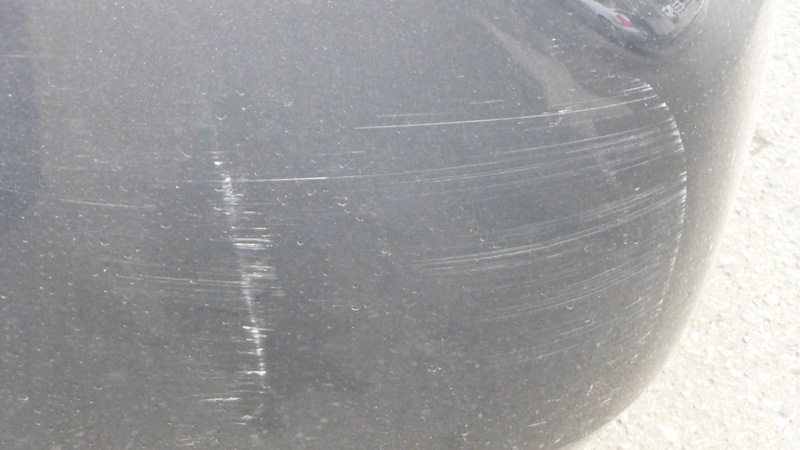 Anyway, as I stood there watching this guy walk around the car to inspect it, he suddenly stopped at the very spot where the damage was. Then he leaned in to take a closer look. He touched the spot and spent a few moments looking at it. Then he straightened up, walked over to me and had me sign that everything was okay. What?!!! I couldn’t believe it. I was ready to fight for my dignity and — nothing. My inner fight was deflated. I had prayed all the way to the car rental location reminding God that I was 99.9% sure I was not responsible for this (as if He didn’t know). I asked Him to be my Judge and to please show me grace and mercy so that I wouldn’t have to fight this. And that’s exactly what He did. So — all you car renters — make sure you check and double check the cars you rent. And if you can’t inspect the car very well because of lighting or the car is wet, note that on the form they give you to sign. Oh — and don’t forget to pray if something should go wrong (you can pray when it goes right also). God cares about the little things that affect us in life whether we’re right or wrong.